Pupillary Distance (sometimes referred to as ‘PD’), is the measurement (in millimeters) of the distance between pupils. It is needed to ensure the optical centre of the lenses is aligned with the centre of pupils. If PD is not filled out in your eyeglasses prescription, you will need to measure it yourself or by your friend. Follow these simple steps to measure your PD at home. 1Stand in front of a mirror (no need for a full length one, you just need to see your face). 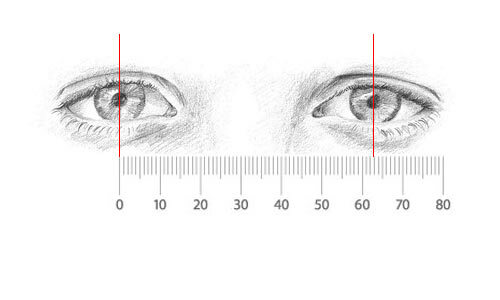 2Place a millimetre ruler on the bridge of your nose, lining up the starting point 0 mm with the center of one of your pupils. 3Look straight ahead (this step is important; the measurement of your PD is only accurate if you are looking straight ahead). 4Your PD is the measurement that lands in the center of your other pupil. 5Repeat these steps 2 or 3 times to make sure that is accurate. 1Your friend must seat opposite you at the same height. 2Place a millimetre ruler on the bridge of your friend’s nose, lining up the starting point 0 mm with the center of one of his pupils. He must look straight into your eyes. You should close one eye for more accuracy. 3Your friend’s PD is the measurement that lands in the center of his other pupil (read it with one eye closed for more accuracy). 4Repeat these steps 2 or 3 times to make sure that is accurate.